August 11, 2016 - "Press Releases"
Admix Inc. announced the relaunch of several services, including lab testing and trial programs, for the sanitary mixing industry Monday. 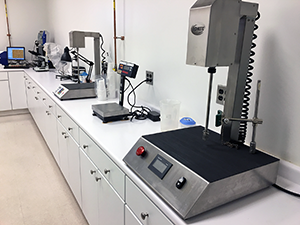 The Londonderry, NH-based company, along with its Allerød, Denmark location, is offering complimentary lab testing for recipes and formulas in pilot test labs. Applications engineers work with clients to test ingredients, applications, and processes to prove the value and efficiency of Admix’s mixing technology. All of Admix’s products, including emulsifiers, wet mills, powder induction systems, and high shear mixers, are available for a 14-day trial. This program offers a “Try & Buy” where processors can apply for prorated trial fee credits and final unit prices. The company also offers on-site product demonstrations of the Rotosolver pilot unit in the US and Europe and the DynaShear inline emulsifier and Fastfeed powder induction system in some locations. Admix said it has invested heavily in aftermarket support and field services in 2016, and provides a comprehensive spare parts program, priority scheduling for customer audits, and implementation of preventative service programs. Another addition is a quick ship service for its flagship products – the DynaShear inline emulsifier and the Rotomixx portable low shear agitator – which can be shipped in 14 days after an order is received.